It’s the holiday season, and it’s a time when the scammers like to come out of the woodwork. In recent years, holiday scams have become notorious for targeting online shoppers and people who frequent social media. Here are some of the major scams that you need to be aware of this time of the year. Every year, more and more people do their holiday shopping online. This makes them a prime target for online phishing scams. Some of these can come in the form of fake shipping notifications. In this scenario, someone disguises their email to read and look like a legit company and wants you to give them information to get updates about your purchased item. These can be tricky because at first look they look real. To keep out of trouble, always know what you have purchased and what company is responsible for shipping the item. If it is a company you have never heard of, delete the email immediately. Remember, real shipping companies don’t need your personal details to track your package. Another phishing scam that can be popular during this time of year when online shopping is at a high is one where someone makes a phony website that looks just like a legitimate website of another company. If they can get you onto the fake website instead of the real one, they can get all of your information you enter including your address and credit card information. To be sure that this scam does not happen to you, the first thing you need to do is check to see if the web address starts with http or https. If it has the “s” you will know the site is secure and your info is likely safe. Another thing you can do is to hover over any links on the page to see exactly where they go–if the linked page looks like it takes you off the main site, you might be on a fake page. Another scam to look for when holiday shopping is the type of payment you are asked to make. If anyone asks you to make a wire transfer, use a third party or any other form of payment that can’t be traced or reversed, then it’s time to get out of there. If they are asking for an unusual method of payment, you can be sure that something is not right with the transaction. Many people like to ramp up their charitable giving during the holiday season, and with that comes a lot of people trying to scam their way into your wallet by setting up fake charities. If someone calls you and asks you to make a donation over the phone–don’t do it. Always do your research and know the charities you wish to give to. Look up their websites and make sure they are legit before you give them a dime. Once you know which organizations are legit or not, make a list to keep track of those you would like to give to so you will be less likely to be scammed next year. The basic way to ensure you don’t get scammed online or in the real world is to be aware of your surroundings. If something looks fishy, it probably is. If you don’t feel comfortable entering your information on certain websites or over the phone–don’t. Trust your instincts when you see red flags and protect your information. Only then will you be more likely to have a worry-free holiday season. The holiday season is in full swing! It’s time to trim the tree, buy gifts and celebrate with family. 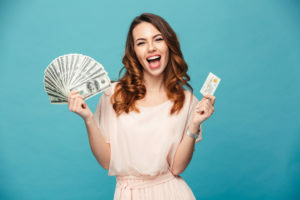 However, you don’t have to go into debt and a potential financial crisis to have a happy holiday–there are many things you can do to avoid the ugly post-holiday financial hangover in January. 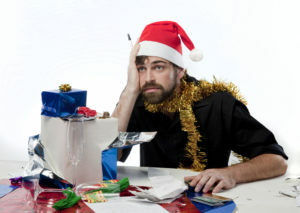 Here are some preventative tips to avoid a financial disaster at Christmas. As always, the first step to avoid financial danger is to plan out everything. Make a holiday budget that includes everything from how much money you have to spend to a breakdown of who you need to buy for and how much you are willing to spend on each person. If you plan out your purchases, you will be less likely to have any surprises when the bills come due in January. When purchasing gifts, try to avoid using your credit card. You don’t want to start the new year off with a high credit card bill and a bunch of payments you can’t afford. Instead, see if your store offers some sort of layaway program. Many stores offer this around the holidays, and it is a very effective way to avoid debt but still be able to make payments on items you wish to buy. The store usually requires you to put down a small payment to hold the item. Then you pay on it when you can until the agreed upon date. Once you’ve paid it off, you can take it home with you. If you don’t end up paying it off, you do lose the money you already put on the item and you will not get to take the item home, so be sure of your purchases if you decide to take this route. When you finally do purchase all of the items from your planned budget, it is always a good idea to keep track of every purchase. Write down every purchase you make, and keep receipts in case you need to make a return. This will help you see how closely you stuck to your budget, which will help you plan for next year more effectively. Once you have all of your gifts purchased, it’s time to make them look pretty! Instead of going to the Hallmark store (or even Walmart) for all of your gift wrapping needs, take a look at what your local dollar store has to offer. Most of the time you will find beautiful wrapping paper, bags, tissue paper and bows for a fraction of the price at another store. The dollar store even has scissors and tape to help you as well. Always check out the options at the dollar store for gift wrapping before purchasing it elsewhere. When the holidays are over, start planning for next year’s Christmas budget immediately. This may sound like overkill, but if you can start saving a little money here and there for Christmas every month starting in January, you will be way ahead of the ballgame next time the holiday season rolls around. 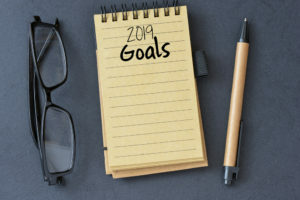 Take a look at your plan from this year and see what worked and what didn’t work and use that to start hatching a plan for the next year. It’s never too early to start a good plan. If you need help planning out your Christmas money for next year, take advantage of WCU’s Christmas Club where we help you put money back each month automatically. You will receive the money just in time for you to shop for gifts near the holidays. To enroll in this program, just give us a call at 256-355-5010, and we can get you set up! 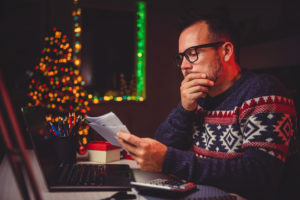 Holidays can wreck your finances if you don’t have a clear cut plan in place, so take this advice and have a successful holiday season.